If you always feel like you are a failure when it comes to maintaining an attractive and lush green garden and lawn, the most practical alternative is the installation of artificial grass. Unlike natural grass, it is a lot more convenient to install and does not need a ton of maintenance. It is an ideal feature for your lawn, plus you can even use it indoors. However, the use of artificial grass comes with the responsibility of proper installation. If you do not know how to install synthetic grass, you might as well tap someone who does. You see, there are mistakes you potentially can make that will ruin the newly-bought lawn. You should focus on learning what these mistakes are to avoid making them. A crucial requirement of a successful artificial turf installation is ensuring that the surface is completely even. Since you are no expert on how to install synthetic grass, you probably are not aware that the smallest incline or bump could ruin everything. It is similar to the botched installation of a new carpet over an uneven floor. One of the versatile qualities of artificial grass is that you can choose the type of underlay you intend to install underneath the lawn. However, you must put in added attention and focus on it if your garden happens to be on an incline. Keep in mind that laying base materials under the synthetic turf ensures proper drainage of pooling water. The challenge of installing artificial turf on your lawn is that you must give keen attention even to the smallest details. So, also if you are confident that you can install it without the need of a professional, you may likely fail if you are not thorough enough. There are certain aspects of the installation process like securing and neatening the edges that require focus. If you are not aware of those things, the possibility of failing is high. You also cannot afford to ignore the importance of research as it is the most effective way to learn about your options. 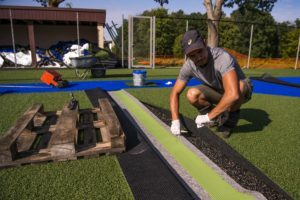 We talked about earlier that there are several types of synthetic grass, and if you do not know what you are buying, it is likely that you also are clueless as to the correct installation. The thing is there are specific requirements for installing grass, and if you decide to do it on your own, you should equip yourself with the right information about those requirements. To conclude, installing synthetic grass does not have to be something that will overwhelm you. If you want to ensure your investment will not go to waste, it is best to hire the pros.